Herod Antipas, son of Herod the Great and Malthace, ruled as Tetrarch for 42 years, with a degree of competence and insight into Jewish customs which combined with his Roman education to explain his curiosity about Jesus. It would have been very easy for Jesus to defend himself before Herod, who is taking the trouble to question him “at some length”. 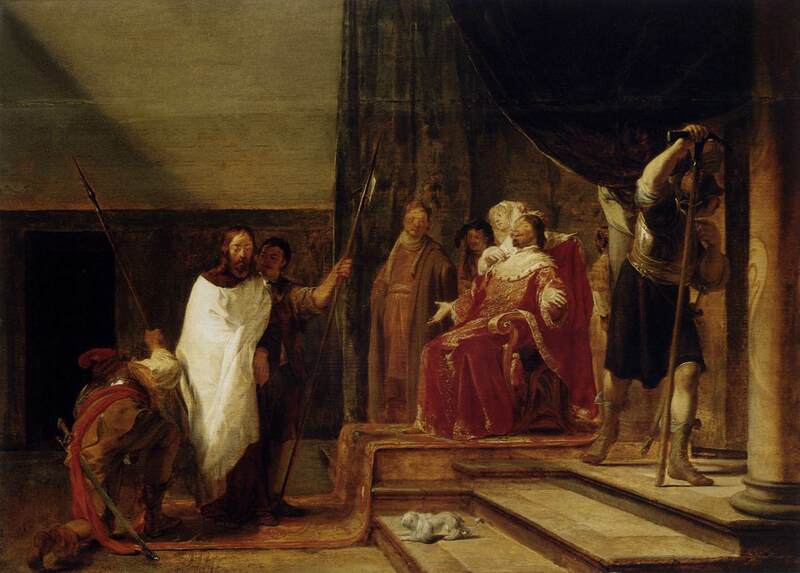 Instead, he keeps silent even when, in exasperation at being denied in his own palace, Herod begins to mock. Nicolaes Knüpfer’s painting emphasises some of the many questions Luke’s short paragraph raises. Why did Pilate send Jesus to Herod – because he didn’t want to find Jesus guilty, or to stress the Jewish involvement? Is Luke recounting the episode to reflect on the opening verses of Ps 2 or, as Matthew’s gospel has (Zoroastrian) Magi in the infancy narrative, to involve kings at the end? Who has Herod been influenced by in his court to have even heard of Jesus – the woman standing behind the throne in the painting? Who is she: is Herodias sufficiently a woman of power, or has Joanna, the wife of Chuza his steward, been busily gossiping the good news, to provoke Herod’s interest in this miracle worker? We might consider what the artist is saying. Why, for example, is there a small dog in the foreground? Is it a reflection of folklore, a dog accompanies a death? Oddly, Knüpfer does not include a dog in his picture of Tobit and the Angel – why place one here? If the implication is that it is not necessary to paint both, because where Raphael (the angel of healing) is, there also is his dog, then we recognise Jesus’ need of healing after the mental and physical beating he has already taken. Magi and angels mark the end of Jesus life on earth; a dog in Zoroastrian thought escorts the dying. As Luke spells out – in silence is the culmination of a life lived in obedience, for the good of us all. and in that faith may we stand. © 1987 WGRG Iona Community. The Rev’d Ruth Browning – retired minister, member of Thornbury URC.